This Hubble image shows a a mysterious protostar, LRLL 54361, that behaves like a flashing light. The image was released Feb. 7, 2013. An odd flashing star may actually be a pair of cosmic twins: two newly formed baby stars that circle each other closely and flash like a strobe light, scientists say. Astronomers discovered the nascent star system, called LRLL 54361, with the infrared Spitzer observatory and the Hubble Space Telescope, and say the rare cosmic find could offer a chance to study star formation and early evolution. It is only the third such "strobe light" object ever seen, researchers said. The celestial oddity is located about 950 light-years from Earth and lets out a bright pulse of light every 25.34 days. Hubble telescope scientists said the baby star object (or protostar) is the most powerful such stellar strobe found to date. But understanding what's causing the flashing light is difficult, because the system is hidden behind opaque dust and a dense disk of material. "This protostar has such large brightness variations with a precise period that it is very difficult to explain," astronomer James Muzerolle of the Space Telescope Science Institute in Baltimore, Md., said in a statement. Muzerolle is the lead author of a paper detailing the finding published recently in the journal Nature. This infrared image from the NASA/ESA Hubble Space Telescope shows an image of protostellar object LRLL 54361. The image was released Feb. 7, 2013. However, Spitzer's infrared eyes were able to peer through the dust enough to discern signs of a protostar, or a pair of protostars, no more than a few hundred thousand years old. Follow up observations with Hubble showed a dusty disk of material around the object with two empty cavities above and below it. 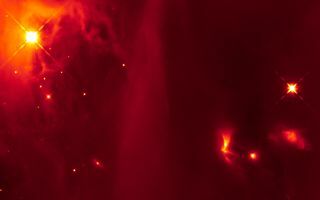 These cavities were likely blown out by a powerful outflow coming from the central stars. The scientists suspect that when the two stars swoop close in their orbits, they drag dust and gas from the surrounding disk, which then falls on one or both of the stars, which let up a flash of light. Astronomers have seen such a phenomenon, called pulsed accretion, before, but never in a system so young, flashing so regularly and intensely. Close binaries like LRLL 54361 are rare in the galaxy, so scientists think this system may represent a short-lived phase of star systems' evolution.